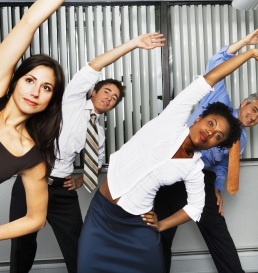 Breathe new life into stale workplace wellness programs. Nothing brings down morale like a gray, rainy spring. Summer fun seems so far away when galoshes become daily wear and you carry an umbrella everywhere you go. Have the overcast skies left a gray cloud hanging over your office? Are your normal health and wellness activities feeling a bit stale? It might be easier than you think to breathe new life into your office simply by using some fun workplace wellness ideas. Making things fun is the best way to engage your employees, and engagement is the key to a successful workplace wellness program. With fun in mind, we’ve put together a list of ways you can put a little springtime pep back into your office. Bring Back Recess: Recess was the best part of the day when you were a kid – so why not bring it back? Schedule a mandatory mid-afternoon 15 minute break to go outside, chat with a friend, and simply recharge for the rest of the day. Go to the fair: Health fair that is. Host a health fair at the office, and give your employees access to massage therapists, blood pressure screenings, biometrics, and more. Grow Something: f you’re lucky enough to have outdoor space, planting a garden remains one of the most popular employee wellness activities around. Stuck inside? No worries, there are still many benefits to filling the office with indoor plants. Challenge Yourselves: Everyone loves a good challenge right? This can be as simple as drinking 8 glasses of water a day, or running 5 miles a week, or as involved as an organized program designed specifically for your office. Join a CSA: If an office garden just isn’t practical, join a local farm’s CSA (Community Supported Agriculture). Find one near you to enjoy weekly shares of fresh, local produce. Learn at Lunch: Bring in a speaker for a Lunch and Learn, and treat your employees to a presentation on topics like, “Good Fats vs Bad Fats,” “Quick Healthy Meals,” “Smoking Cessation,” and more. Get Moving at Meetings: Try starting or ending meetings with a quick round of group exercise, such as simple yoga poses, light stretching, or jumping jacks. So what do you think? Are you going to bring back recess? Plant some tomatoes? Maybe this list has inspired some new employee wellness program ideas of your own.